GATE 2018 Schedule, GATE 2018 Exam Date, GATE 2018, GATE Dates, GATE Time Table: GATE 2018 exam will be conducted from February 2 to February 10 next year. The Graduate Aptitude Test in Engineering (GATE) 2018 exams will be held in two sessions on February 2, 3, 09 and 10. According to the schedule released recently, Mechanical Engineering (ME), Engineering Sciences (XE), Life Sciences (XL), Ecology and Evolution (EY) and Petroleum Engineering (PE) GATE 2018 exams will be held on February 2 on the forenoon session. ME GATE 2018 exam also will be held scheduled for the afternoon session on the same day. Indian Institute of Technology (IIT) Guwahati is the official organisor of GATE 2018. 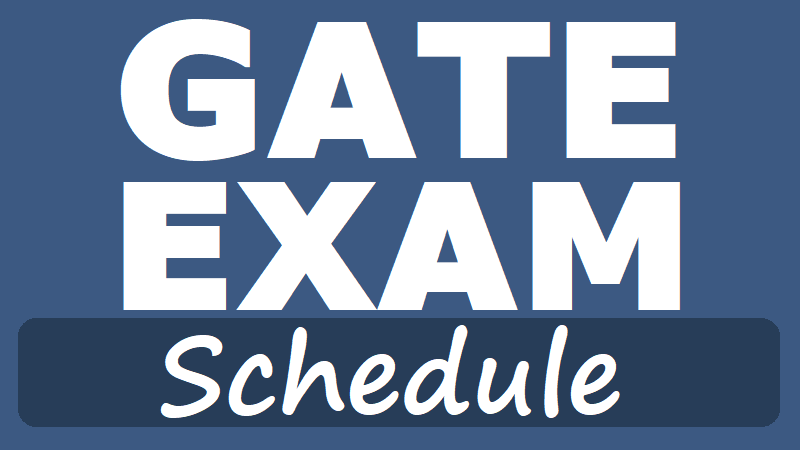 IIT Madras has released the exam schedule for the GATE 2019 exam on gate.iitm.ac.in. The exam is scheduled for February 2019. It will commence on February 2 and conclude on February 10, 2019. GATE 2019 will be held in two shifts each day (morning and afternoon). GATE 2019 admit card will be released on January 4, 2019. The GATE 2019 exam is an entrance examination for admission in post graduate and research programmes in the country. A new paper of statistics has been added in GATE 2019 syllabus. Gate 2019 will be conducted in 24 papers and a candidate can appear only in one paper in any one session. Qualifying in GATE enables candidates to seek admission to or receive financial assistance to master’s programmes and direct doctoral programmes in engineering/technology/architecture and doctoral programmes in relevant branches of science in all institutions supported by MHRD and other government agencies. GATE tests the comprehensive understanding of candidates in various undergraduate subjects in engineering/technology/architecture and post-graduate level subjects in science. All the candidates are advised to check the official website for the complete schedule on the link provided here. Please note that abbreviations have also been explained on the page. The admit cards would be released on January 14, 2019. Candidates are advised to keep a check on the official website gate.iitm.ac.in for updates regarding the examination. GATE 2018 Admit Cards will be available on 4th January 2019, on the official website of Graduate Aptitude Test in Engineering - GATE 2019 - gate.iitg.ac.in/. The notification pertaining to the same on the web portal read, “Admit Card will be available in the Online Application Portal (for printing) - 04th January 2019.” GATE 2018 is scheduled to be conducted across the country on 2, 3, 9 and 10 February 2018, next month, in two sessions viz forenoon from 9 am to 12 noon and afternoon from 2 pm to 5 pm. Candidates who have enrolled for GATE 2019 must keep a tab on the official website on 4th January to download their admit cards as and when they are released. The Admit Cards will carry important instructions for the candidates along with important information like Enrollment Number, Registration Id, Roll Number, Date of Examination, Venue, Time/Session and Paper. While Graduate Aptitude Test in Engineering - GATE 2019 is one of the most crucial exams for candidates seeking admissions in Postgraduate and Doctoral programmes in IITs, IISC and various prestigious engineering, technology and architecture institutions in India; it is also considered by various Public Sector Undertakings -PSUs to shortlist engineering candidates for their internal recruitment processes. Graduate Aptitude Test in Engineering (GATE) 2018 is a mandatory requirement for seeking admission or financial assistance to master's programs and direct Doctoral programs in Engineering or Technology or Architecture and Doctoral programs in relevant branches of Science, in the institutions supported by the MHRD and other Government agencies. Even in some colleges and institutions, which admit students without MHRD scholarship /assistantship, the GATE qualification is mandatory. GATE exam is held by Indian Institute of Science (IISc) Bangalore, IIT Bombay, IIT Delhi, IIT Guwahati, IIT Kanpur, IIT Kharagpur, IIT Madras and IIT Roorkee on behalf of the National Coordination Board (NCB)-GATE, Department of Higher Education, Ministry of Human Resources Development. Apart from its academic use, the GATE 2018 scores are also mandatory for job applications in several Public Sector Undertakings (PSUs).